Using knitting graph paper is the easiest way for me to create new designs and patterns. 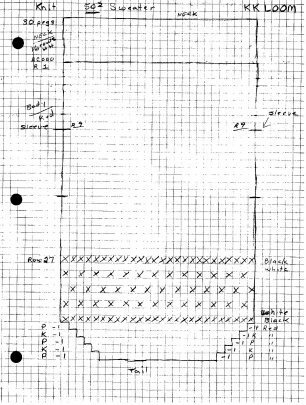 This is always my first step and the graph paper is much easier to read and to follow while you are creating a pattern. First I draw up a rough picture of what I want to make. I really mean rough because I am no artist. Than I make a tension swatch about 40 stitches by 20 rows. I measure how many rows and stitches are in an inch. Than I can figure about how many rows I need, where to decrease, increase or bind off. Lets use my dog for an example. They are both small breed dogs so it will be easy to explain. For the sweater I had to measure from her neck to the tail base. Than around her chest. I knew I wanted a V shaped chest piece so my dog sweater was going to be in two pieces. Now multiply how many rows are in an inch, times how many inches long your sweater needs to be. Now you know how many rows you need. Do the same with stitches and this will give you the width around for stitches you will need. I will put this information on my graph paper and draw out my basic pattern. Remember this is a rough draft. This is the starting point using the graph paper. Now I will tweak where I need to decrease or increase. Once I have all the pattern size figured, I than work on the design. I put Xs in the squares for my design. Here we are using a simple design to show what I mean. If I use more than two colors I can use color pencils to make my design. It is always for quick reference. Than I knit up the pattern and make necessary changes. There are always some minor changes I need to make. 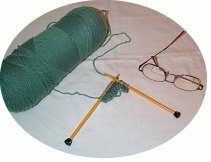 So that is pretty much how you can make up your own free simple knitting patterns using knitting graph paper. Now is that clear as mud or not? Any questions just drop me a line. I will try and clear it up.